Red says romance, mystery, vivaciousness and naughtiness -- at least in this Hooch Bag I created for my pal Eleanor's birthday. The flowered purse is innocent enough as is the vintage Hallmark scarf, but just look inside this party gal's loot and you'll see another side that's usually kept under wraps. Why, what's she doing with all that funny money, the (candy) cigarettes and that nip of vodka? Whoa, did I get an earful. I should have know better than to ask! If you'd like a Hooch Bag customized just for you, email me at theelegantthrifter.com. Or take a spin over to Hooch Bags by The Elegant Thrifter. Reuse & Repurpose: Map It! I can really get my head around the way Brooklyn Industries, a maker of inexpensive men's and women's apparel, always seems to have amazing windows that creatively show how to take others' castoffs and turn them into eye-pleasing displays. The current vitrine does not disappoint. 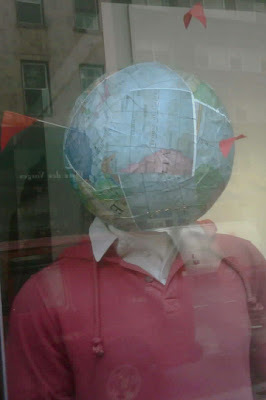 The papier mâché globe heads greeting passers-by are so cheery and unexpected that they make me think of third grade craft projects or the the silly Globey character on Pee Wee's Playhouse. Made from map pieces randomly formed into an orb, it doesn't matter if Australia is where Arizona should be, or if Cancun ends up at the North Pole. These brand ambassadors offer a world vision that isn't barred by borders or race, and seem to welcome anyone who feels like they want to hang out on Planet Earth for a while. Last week I promised you a video of my making the retro-tabulous "Tunnel of Fudge" cake, and, after much editing...here it is. You may notice that I couldn't help but use the B-52's Cake as a soundtrack, even though I've used it to enhance the making of a pineapple upside-down cake once before. While this cake, in all truthfulness, did have trouble coming out of its pan -- and I got lots of suggestions on how to prevent this -- it was delicious, and the recipe is available on the Nordic Ware site here. Julia Child gave some very good advice to home cooks: never apologize to guests for what you perceive as a mistake. And while this cake had some cracks and dings, it was delicious right down to each and every crumbly bit! To me, this collection is almost as heartwarming as the story of how it began. 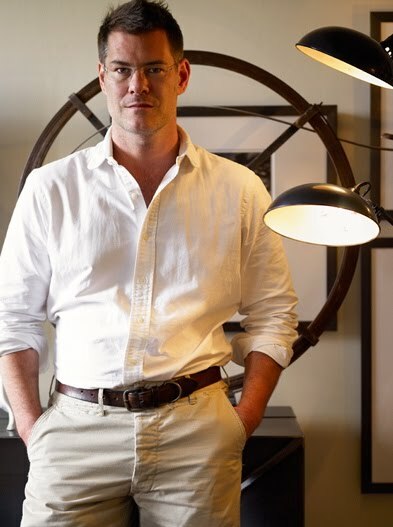 While I was scouting the Fire Island community of Saltaire for The Find: The Housing Works Book of Decorating With Thrift Shop Treasures, Flea Market Objects, and Vintage Details, I marveled over a group of mugs featuring the British royal family, and a father told me how it started. On his young daughter's first trip to London with her mother, the little girl was searching high and low for a special gift to take home to her daddy who stayed home to run the family business. 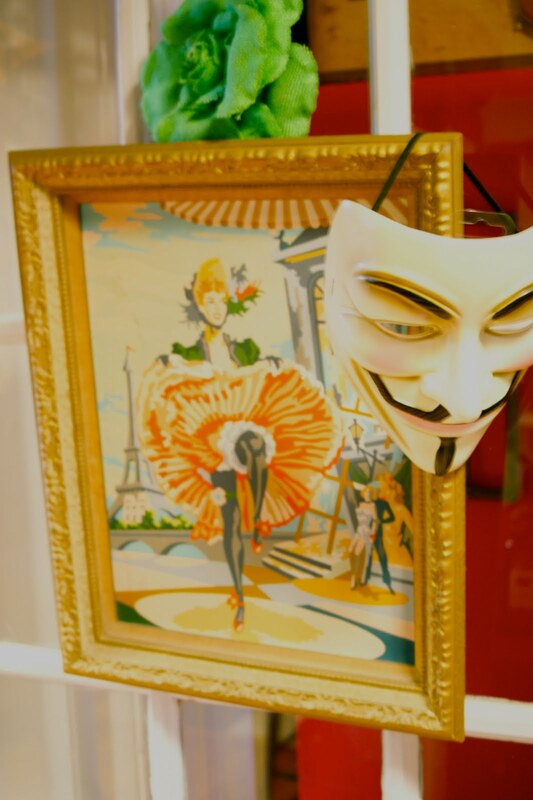 The girl's curiosity took led her and her mommy into a London thrift store where she spotted a mug celebrating the Queen Elizabeth II's jubilee. Thinking that her daddy would like it, she used the money she had budgeted for the souvenir and took it home, where it prompted the beginnings of a clever collection. Now whenever family and friends see a "royal" mug, they buy it to add to the original collection -- one that has now outgrown its windowsill. Collections are a great way to create focal points in a room. By grouping similar items and confining them to a specific area, it also helps reduce clutter of favorite objects spread all over the place and helps you tell a design story. If the sentiment behind your collection is anywhere near what's held in these thrift-store mugs, then its charming tale is most certain to endure for many years to come. I can only imagine the lively conversations this old Corning Ware casserole dish has heard over the years at church socials, family gatherings, holiday festivities and bridge games. This pretty dish belonged to my friend Eleanor's mother, and she passed it on to me, knowing of my fondness for a good old casserole, even if I talk about them more than I actually eat them! There's something comforting about the idea of a meal in a single dish -- something that comes piping hot from the oven and goes straight to the table. When the meal is finished, a lid just covers the leftovers and its whisked off to the fridge for safe keeping until it's time to be reheated for a midnight snack or a quick lunch. When I was a kid, my mom had several casseroles ready to produce upon a special occasion. One was a green rice casserole, made, of course, with white rice, a mixture of broccoli and probably a can of cream of mushroom soup. There was yet another delicious broccoli casserole that had many of the same ingredients, minus the rice, but was sprinkled with margarine dipped saltine cracker crumbs. We also had our share of tuna casseroles, layered with egg noodles or elbow pasta and topped with pieces of stale bread that in the oven turned into crunchy croutons. I remember the excitement of covered dish dinners that always displayed a variety of creative casseroles. 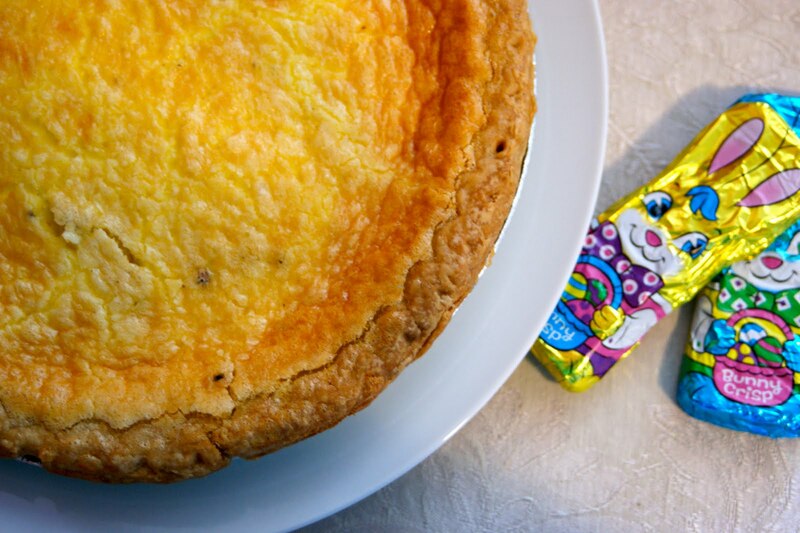 Whether it was a Christmas party with the faculty at my dad's elementary school or an Easter dinner laid in the woods by my grandmother's church, the delights were mind boggling. There was usually a sort of bean casserole with canned onion rings on top or maybe a layered bacon and peas concoction. And for convenience sake, I've seen an ambrosia made from fruit cocktail, mandarin oranges and shredded coconut or a three-bean salad make their arrivals in a Corning dish, even though neither are technically casseroles. Some people turn their noses at the thought of a casserole, but I can assure you, I've served them up to the fanciest and finickiest folks in New York City and there's hardly ever a leftover. 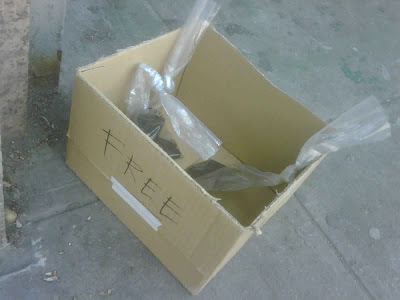 On my way to the gym one day earlier this week, I noticed this box, which at the time was filled with these little, mysterious plastic bags. Being New York, it's crazy the stuff you see on the street, so unless it appeals to me in a split second, I just walk on by. So it wasn't until my trip back home that I saw the letters "FREE" written in marker on the box lid, and the considerably fewer number of bags remaining inside. Upon further inspection, I realized that the bags each held broken pieces of art charcoal, which made sense because it was practically on the stoop of an art supply shop. And, of course, I helped myself to a bag of coal. At other times of the year, it could be a symbol of being naughty. But on that sunny day, I felt pretty nice! Do you have a free find you'd like to share? If so, email me a photo and your story to theelegantthrifter@gmail.com! What can you do with a bunch of paper clips? Well, you could stick some papers together (duh! ); you could bend them out and turn them into tiny desk sculptures; use them the fix the broken chain in the toilet tank; use one to mark your page in your favorite magazine or paperback; hang a Christmas ornament on the tree; or turn a bunch of them into a lamp shade. A lamp shade, you ask. 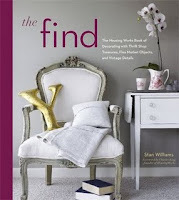 That's exactly what I discovered when I was scouting fashion designer John Bartlett and master framer John Esty's apartment for my book, The Find: The Housing Works Book of Decorating With Thrift Shop Treasures, Flea Market Objects, and Vintage Details. Hanging from the ceiling in Bartlett's former office and encircled around a sinister Edison bulb was this structure made of metal rounds attached with hundreds of crisscrossed paper clips. While this clip shade doesn't reduce the illumination of the bulb, it does accessorize a long, single bulb that would otherwise be nakedly suspended above a desk. And it might keep you from bumping into a hot bulb! Now I have a big bundt question for you: if you make this cake, do you have any hints on how to keep it from sticking in the pan? I buttered and flowered as instructed, and followed the mixing and baking directions to a tee. But when I tried to remove the pan, well, you'll see next week the mess! I will say, however, that despite the cake wanting to stay forever inside its bundt pan, it was absolutely delicious! A boxed cake cannot compare. Come on back next Wednesday, and my video should be completely done. Now if it "sticks," that's another story! Here's a toast with cups of coffee to the creative guys behind Fred Flare for turning a bunch of Chock Full o' Nuts coffee cans into a collection that becomes a focal point in their kitchen. As I was scouting Chris Bick and Keith Carollo's Chelsea digs for my book The Find: The Housing Works Book of Decorating With Thrift Shop Treasures, Flea Market Objects, and Vintage Details, I snapped this photo of coffee cans gathered atop their kitchen cabinets. The graphic installation brought to mind the way that Andy Warhol glamorized everyday objects and turned them into his signature pop art. And it proved, once again, that you can create a collection out of just about anything, as long as you are consistent either in theme, color, shape, size or nomenclature. While this group does convey a sense of wackiness, it also offers visual appeal in and area of a kitchen that's often ignored to gather dust in a rental apartment. The clever group arranged in an attractive pyramid also detracts from the cracks in the ceiling, and, well, makes me want to brew up a cup of java! I've told you before how it's always this time of year that my heart yearns for Paris. I just want to cash in all my frequent travel points, hop on a plane and just wander around for a few days under the Parisian sky as the days start to lengthen and life becomes energized after a long winter. One of my favorite tourist sites is the Arc de Triomphe. During all the times I've visited Paris it wasn't until the last time that I actually went to the top of the arch. In fact, it had been closed for so long under renovation, I don't think I even knew it was possible. Once I read about the renovation, I was determined to visit it, and to this day, I still think it's my favorite view of Paris. Now don't get me wrong. J'adore la tour Eiffel! I love wandering around the city, possibly getting lost, and then looking for the fabled tower to help me find my way. I am mesmerized standing underneath its enormous four feet and looking at the clouds moving through its metal grid. But honestly, when I went to the top, I was so afraid of the height coupled with all the openness of the structure that I really didn't enjoy the experience. That brings me back to my beloved l'Arc de Triomphe. Situated right in the middle of Place de l'Étoile, it's high enough that you see sweeping views all around but low enough that you can see all the details below. (Let me warn you though, there is no ascenseur, so taking the stairs is a must!) What's more, it's situated in the middle of streets that form the shape of a star. How glamorous! The Gift of Thrift: That Takes the Cake! 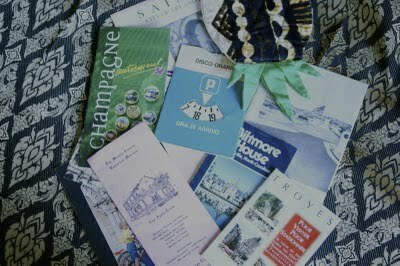 Last summer, I shared with you the contents of a $4.16 treasure trove I found at while shopping at Timess Treasures in Culver City. What you can see here is an assortment of travel brochures (I was most excited about the French ones! ), and a little something that you can barely see at the top of the image. There you go. Now you can see it better. 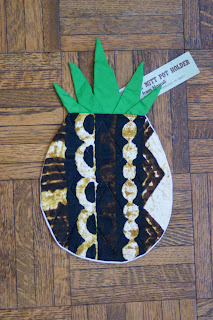 And if you've followed me for a bit, you would know that I could not resist a pineapple-shaped, souvenir potholder from Hawaii. Wouldn't that be perfect for taking a pineapple upside-down cake out of the oven. I stashed my golden goodie away until I saw it was the birthday of Sonya over at Dime Store Thrift. You must remember her. 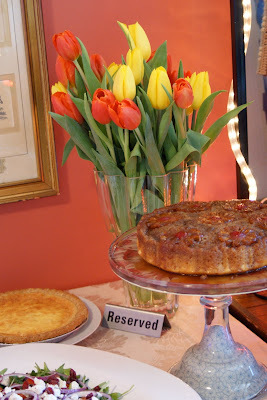 She's the one who last year finagled my secret pineapple upside-down cake recipe out of me! 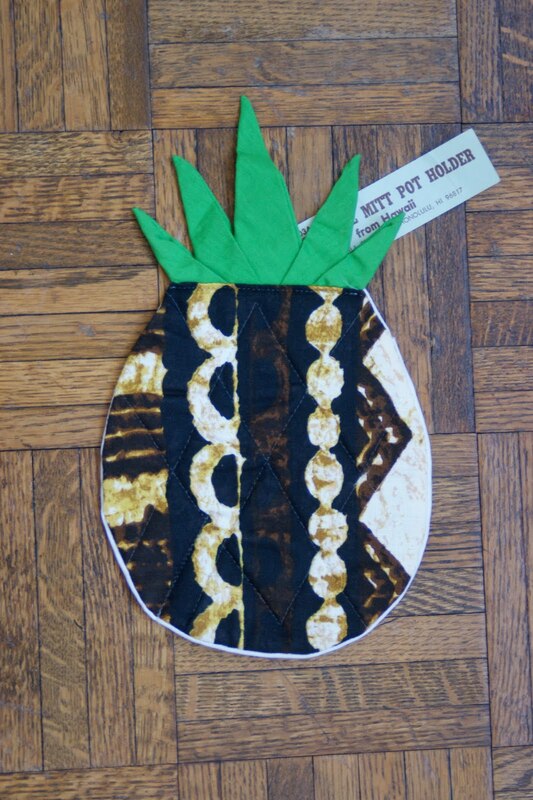 I've decided to let bygones be bygones, so I plopped this little pineapple in an envelope and jetted it off to Sioux City, Iowa for her to safely take her own cakes out of the oven. Reuse & Repurpose: Keep the Silverware Handy! 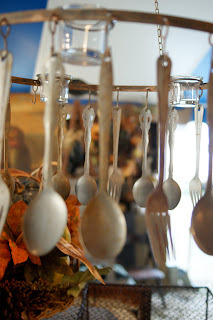 A while back I shared a photograph of something called a "spoondelier," a tiered, chandelier of sorts that instead of using crystal pendants, it used, you guessed it, spoons. Well this little number I spied at the Round Top/Warrenton flea market in Texas last fall with my pal LeAnn Stephenson, The Vintage Laundress, and it makes use of the entire silverware drawer. Why, you could hang it low over the dining table and let people serve themselves. Or maybe you set the table and someone discovers they're missing a fork or a spoon. No need to get up and leave the meal. Just reach right up and grab another. But you're out of luck if you're looking for a knife. Maybe they have a matching wall sconce hanging out somewhere just for that purpose. 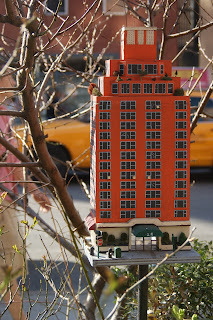 I call this high-rise home "Wren Heights," a luxury residence for flighty Manhattanites. Or what about a modest home that makes you think of simpler times? 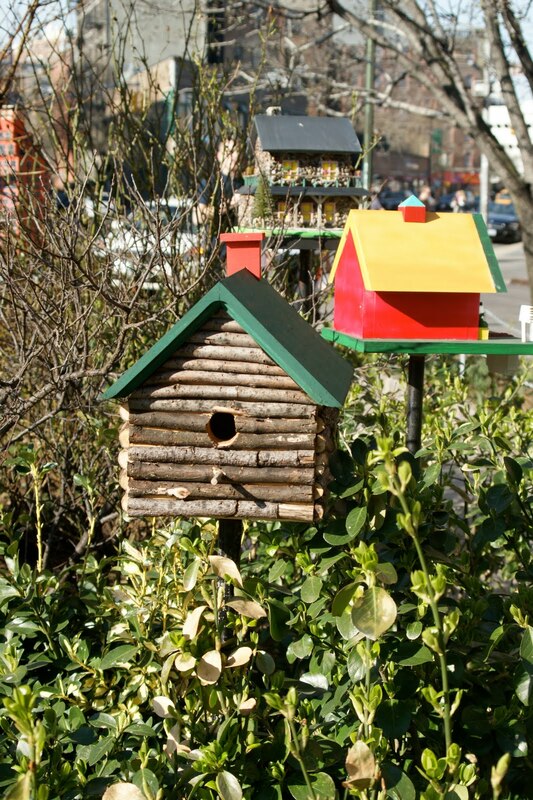 Why this "Little Sparrow House on the Prairie" is in move-in condition." And finally, this two story "Stone House for Starlings" comes complete with a pool perfect for wing flapping. The Find: Give Me a Buzz! Last summer when I was celebrating the work of Maison Rêve's Yasmine McGrane on the cover of The Find: The Housing Works Book of Decorating With Thrift Shop Treasures, Flea Market Objects, and Vintage Details, I puttered around in the back room of her shop and landed upon this old aqua rotary phone. I can't remember the last time I used a rotary phone, but always remember feeling handicapped as a kid when it came to attempting to be the 10th caller to win a prize from the local radio station. Dolly Parton tickets? Forget it. Go-Gos's tickets? Never. Worlds of Fun passes? No way! I never won any of them, and blamed it on all the touch-tone callers who beat me to the prize. It's funny how today, a simple phone call in itself is becoming a rare occasion. Sometimes, you even feel like you're invading somebody's space by calling them up, even when their number is clearly printed on the business card they themselves offered you. "Oh, just email or FaceBook me," is a common response. But then, sometimes when you do take the moment to actually make someone's phone ring, you -- surprise -- reach the person with whom you wish to speak! I love it when that happens. Or you see a mysterious number show up on your caller ID, you hesitate to answer it, but then you do and low and behold, it's someone you really want to chat with. Maybe they relay the news of a fun gathering or even have word of a promising professional proposal. Those are the kind of phone calls I like! Here's hoping that your phone rings with some fantastic news this week! The Object of My Desire: Yes She Can, Can! Lately, everywhere I look reminds me of Paris. A friend is in the city of lights with her husband and sending out messages from Twitter. I re-discover my old "Paris" baseball cap -- the one I wouldn't be caught dead wearing in France -- and happily use it to shield the top of my head from the warming spring sunshine. And finally this paint-by-number picture, once again from the eye-candy brimming, Carroll Gardens, Brooklyn, apartment of Michael Quinn, whose vintage tailgate party is featured in The Find: The Housing Works Book of Decorating With Thrift Shop Treasures, Flea Market Objects, and Vintage Details. We had so much windy rain last month that the sight of dead and destroyed umbrellas in the street was a familiar one. While I'm accustomed to seeing the rain protectors turn inside-out in a gust of wind, blow across the street and get trampled by an oncoming vehicle or completely fail to open in a downpour, I've never see quite a gathering of metal and plastic all in one place. Apparently, I was not alone, as there were at least five other people standing in the misting rain snapping pictures of these misfits. And even in the most heavy rain, I wouldn't suggest trying out one of these. But you might say they do make a rather surprising piece of street art. The other day as I was strolling the East Village, I looked in the lobby of an apartment building to find this novel bench made out of a simple piece of wood anchored to the wall, and balanced on the opposing side by two curvy furniture legs. A coat of white paint brings the whole look together to create a handy seating or a smart spot to sort mail. 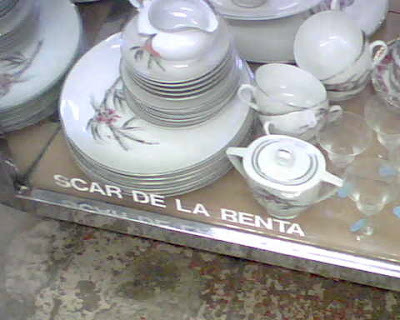 It wasn't so much the china that caught my eye at this Connecticut thrift store but the display case that houses it. I was amused by the sight of a missing "O" from Oscar de la Renta's name, which in turn conjured up the idea of an action-packed, blood and guts film about the world of fashion -- sort of a cross between Mahogany and Scarface, starring Al Pacino as as an ambitious evening gown designer who hooks up with a mobster model muse. Let's just say he makes her do his dirty work as she "offs" the competition along the way to the duos meteoric rise as the stars of fashion. When I see friends recognized for their achievements, it's almost as if I won an award myself. 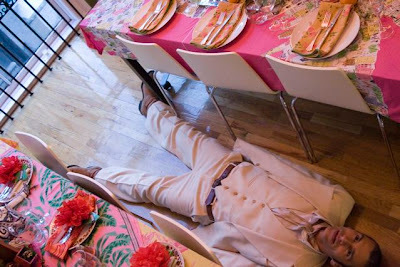 So you can imagine how pleased I was to see that my pal John Bartlett, the acclaimed fashion designer, is going to receive a big fashion industry honor, The American Image Award, on May 26. 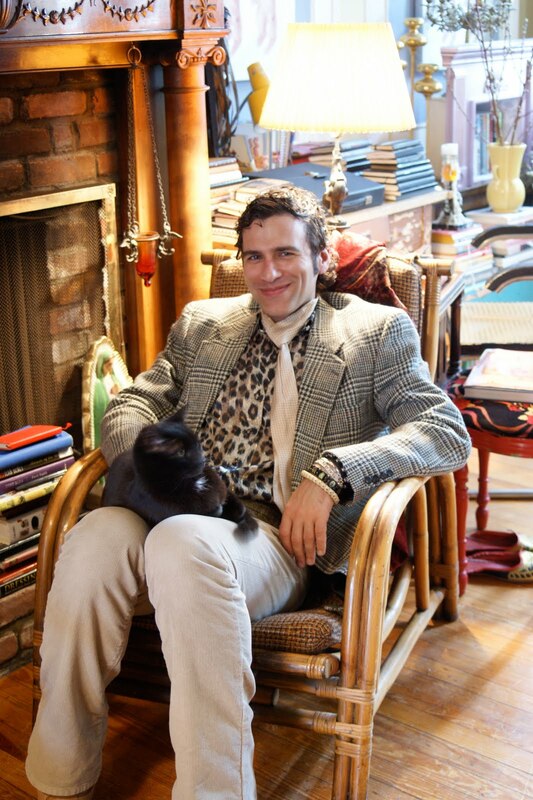 If you're not a fashionista, you might also remember John from my book, The Find: The Housing Works Book of Decorating With Thrift Shop Treasures, Flea Market Objects, and Vintage Details. Here's handsome John in a photo by Jim Franco standing in front of a sculpture that one of our mutual friends, Carl & Co.'s Mark Ciolli, fashioned out of metal pipe snaking that he found in the street. Last week when we toured visual visionary Michael Quinn's Carroll Gardens apartment, there was one cheery item that caught my eye -- and maybe yours too for a fleeting moment as it flashed by in last week's video. This delicate woven basket was hand crafted by Michael's mom out of seed packages. If you watch the videos from last week, you'll notice other baskets throughout Michael's apartment, all masterfully woven by Michael's mother. This colorful craft goodie reminded me of the chewing gum wrapper chains that my sister and I made when we were young. Just like any kid, we loved chewing gum and saved our allowance to buy the treat, not so much for the gum, but also for the varied wrappers. My sister started the chain, and I learned later how to cut and fold the wrappers to make a link and join them into a snaking zig-zag of assorted colors. I can't remember how long this chain ended up being, but it seemed like we worked on it for years. I seem to recall it ending up on the Christmas tree for at least a couple of holidays. I remember that even though the wrappers were void of their contents, they still smelled sweet of Juicy Fruit, Double Mint or Beach Nut, the latter of which came in striped fruit flavors. The aroma from the wrapper was very similar to that of the interior of my Grandma Churchill's purse, which always seemed to contain a package of gum ready to pacify some anxious kids who couldn't seem to sit still during church. Would one of those be me? The quiche lorraine set perfectly and looks cheery next to some chocolate bunnies. My tulips opened just in time to accent my pineapple upside-down cake resting atop my beloved cake tier made by decoupage artist John Derian. Veli made this colorful salad with organic baby arugula that tastes like it came right from the farm. Maybe it did! 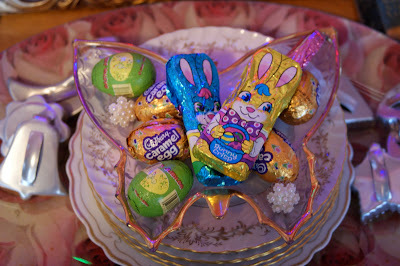 Here's one of my favorite dishes loaded with Easter candy. It reminds me of Dolly Parton and her love of butterflies. I say every day is better with a little Dolly in it! Here's wishing you a Sunday full of fluttery fun! 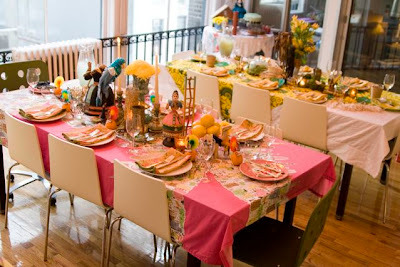 I was beside myself with delight last year when Michael Quinn and Heather Kerr agreed to creative the festive tabletops for the launch dinner celebrating The Find: The Housing Works Book of Decorating With Thrift Shop Treasures, Flea Market Objects, and Vintage Details. The design duo awed with their take on "southern" style, using what they had on hand to create a thrifty, extravaganza of fabulosity that people are still talking about. Here is just a taste of their dynamic work from that evening , expertly photographed by Michelle Talan . And look what we found lying between the tables! If you saw yesterday's post -- or any other from this week for that matter -- you know we've been visiting with visual visionary and vintage and thrift enthusiast Michael Quinn in his Carroll Garden, Brooklyn, apartment. It's the same apartment where he and his pal Heather Kerr threw a retro tailgate party that was documented in my book The Find: The Housing Works Book of Decorating With Thrift Shop Treasures, Flea Market Objects, and Vintage Details. As we finish up today's video visit, I'm sharing with you a photograph of Michael with his kitty-cat companion, Buffy, resting in their favorite vintage bentwood chair. If you listen carefully to the video, you might even hear Buffy chattering. Like I do, she also possesses the gift of gab.